At Downtown Grand, Resort Fees are ﻿﻿charged ﻿﻿$23+tax/night and are mandatory. 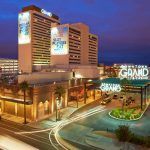 The DOWNTOWN GRAND offers a 35,000 square feet rooftop Pool Deck: the “Citrus Grand Pool Deck”. The pool deck features Infinity pool, restaurant and full bar, semi-private cabanas, a fire pit, backyard games including corn hole, foosball, table tennis and a grassy seating area complete with umbrellas and outdoor day beds.